There are plenty of collaborative document editors out there, but when it comes to getting input about a new document or PowerPoint deck, many businesses still rely on the tried-and-true method of printing them out, handing them around the office, and asking people to scribble their notes directly onto their printed copies. If that situation sounds familiar, you’ll probably want to check out Crocodoc, a Y Combinator-funded startup that’s launching today. Crocodoc makes it easy to share and mark up virtual documents the same way you would on a piece of paper, and it only takes a few seconds to start using it. Crocodoc is an extremely straightforward service, and you don’t even need to sign up for an account to use it — just upload a document, and a second later you’ll be in the Crocodoc editor. Markup tools include Sticky Notes, a highligher, text strikeout, and the ability to leave your own comments (a ‘pen’ tool is on the way). 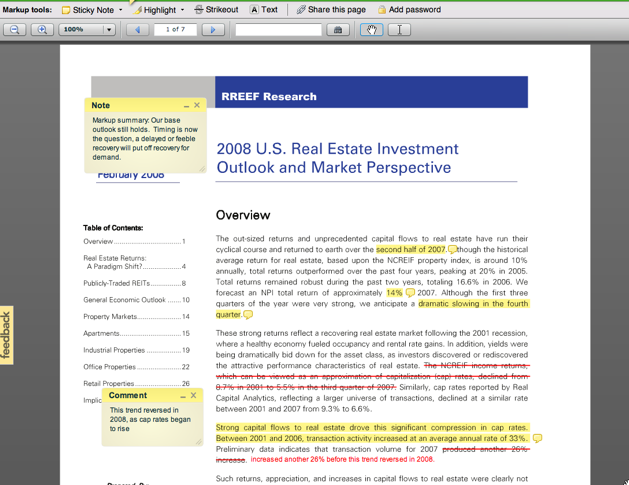 Editing a document should be very familiar to anyone who has used Adobe Acrobat or Apple’s Preview. If you’d like to try marking up a sample document, you can use this demo. By default, the service assigns each uploaded a document a unique, “unguessable” URL, which you can use to share the document with friends, who can mark it up and add their own comments. But there’s one catch to the free version of the service: if you lose the document URL, that marked up document is lost for good (remember, you didn’t create an account to sign up). Fortunately Crocodoc also offers a ‘Pro’ version, which lets you create an account that includes an archive of your previously uploaded documents. It also allows you to password protect your uploaded docs (as opposed to just relying on the hard-to-guess URL for security), and to use SSL encryption. Pro Accounts cost $8/month or $36/year. And for companies that are wary of uploading sensitive files, Crocodoc offers intranet deployments, which means that these customers can run it inside their firewalls on their own servers. My only gripe about Crocodoc is the limited number of collaboration options — you can share your documents with as many people as you want, but everyone will be editing the same one, which seems like it would get messy fast. This will be fixed in the near future, when Crocodoc starts allowing you to review edits on a per-user basis. Crocodoc’s still quite basic, but that might be exactly what its customers are looking for. And they may well be willing to spend $36 a year if it means they’ll have to print out fewer stacks of paper.